We were informed this weekend that UC Irvine's Bren Center will NOT play host to the Commerce Department’s public hearing on the 241 Toll Road on July 25th. They feared that the turnout from supporters of San Onofre State Beach and Trestles would overwhelm the facilities at UCI, estimating that over 10,000 of you would show up. Clearly there is strong community opposition to this destructive highway project, and those voices need to be heard. Unfortunately no other venue has been identified, and the Commerce Department has made no definitive decision on how or when to move forward with the hearing. We will keep you informed as the situation develops, but for now we are assuming there will be NO Hearing on July 25th at the Bren Center. Dear Secretary Gutierrez, You previously promised to hold a hearing in Southern California to gauge the public's feelings on the proposed 241 Toll Road through San Onofre State Beach. The venue you chose for this hearing felt that the expected crowd was beyond their abilities serve properly. This intense public interest is even more reason for you to follow through on your promise and reschedule the hearing to an appropriate venue at a later date. As a member of the public I deserve the opportunity to have my voice heard on this issue. Please do not silence my voice on this important decision. We will keep you informed about any changes. 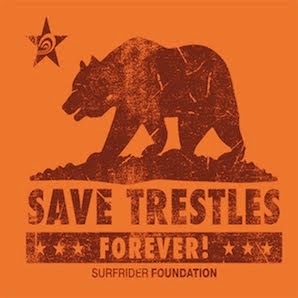 Thanks for your continued support to protect Trestles and San Onofre!! Even though a hearing is important, I think we should look at this as great press. What about the pre-hearing events (i.e. hands at Trestles, OC Tavern), are these events still taking place? Department of Commerce Hearing Events Update.